I love it when you come across a book with a gorgeous cover and then also hear a ton of good reviews about it. 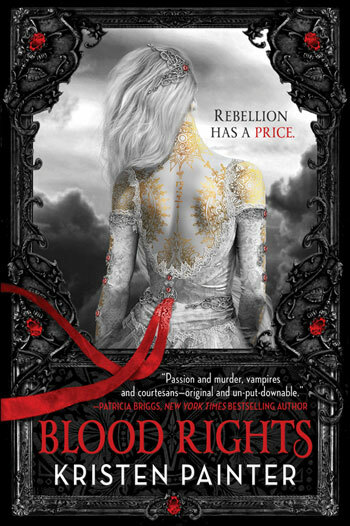 Blood Rights is one of those books. Don’t you just love the cover? Born into a life of secrets and service, Chrysabelle’s body bears the telltale marks of a comarre – a special race of humans bred to feed vampire nobility and control their hungers. When her patron is murdered, she becomes the prime suspect, which sends her running into the darkness of the mortal world . . . and into the arms of Malkolm, an outcast vampire cursed to kill every being from whom he drinks. Chrysabelle’s secrets, though, are about to put her life – and those around her – in even greater jeopardy. She possesses a powerful ring, the key to unlocking an ancient prophecy destined to merge the mortal and supernatural worlds. A chaos unlike anything anyone has ever seen threatens to reign unless she and Malkolm can stop the noble vampire behind the merciless plot. What that description doesn’t mention though, is that it takes place in 2067. I’ve read the prologue and first chapter, and it look like a very interesting world. Plus it’s the type of book that you start reading and just can’t put down; I really need to get my hands on this! Blood Rights is available on Amazon.co.uk for £6.11 and on Amazon.com for $7.99.